Is your line of work search? Never considered Bing for the job? Well, according to newly released figures an increasing number of Australian SEM specialists and marketers are doing just that. According to data released in March by media measurement firm comScore, Bing now represents 11.5 per cent of all searches in Australia which equates to a whopping 137 million searches a month. The study found that one in three Australians have searched on the Bing network when you include AOL and its partner sites. Bing might be playing off a small base in Australia but in the US market – because it also powers Yahoo’s search – it serves 32.6 per cent of all internet searchers (according to 2015 ComScore desktop rankings). Had a household income above $75,000 per annum. 70 per cent of Bing users had a tertiary qualification. Females slightly preferred Bing to the blokes with a 51:49 split. Over 81 per cent of Bing users were aged over 35. However, it was an even-split when it came to having kids or no kids at all. Commenting on the findings, Deb O’Sullivan, Microsoft’s head of strategic Sales, Australia and New Zealand, told B&T: “We know that people search differently across Bing. We also know that our audience is more educated and are spending more online that Google’s audience base. Technology – 14.6 million searches annually. According to Nielsen data when compared to the total population 27 per cent of Aussies have used Bing to purchase a computer or internet-related device compared to 19 per cent for Google. Business and finance – 4.5 million searches annually. According to Nielsen data a quarter of Aussies have used Bing to pay a bill. Some 26 per cent have reviewed their mortgage with Bing, 23 per cent have transferred money and 25 have checked their account balance using Bing. Retail – 3.4 million searches annually. According to Nielsen data when compared to the total population 22 per cent of Aussies have used Bing to purchase clothes online (16 per cent for Google). Seventeen per cent have used Bing for price comparisons (15 per cent for Google). And 63 per cent of Bing users have shopped online for a special or discount (62 per cent for Google). Travel – 3 million searches annually. According to Nielsen data when compared to the total population 27 per cent of Aussies have used Bing for general travel information online compared to 17 per cent for Google. Automobiles – 1.5 million searches annually. According to Nielsen data when compared to the total population 29 per cent of Aussies have searched for information on a car (16 per cent for Google). And eight per cent of Bing users say they intend to buy a new vehicle in the next 12 months. O’Sullivan said of the findings: “I think this comes down to the fact that Bing powers the entire Microsoft ecosystem. Any search completed across Windows, Cortana, Xbox, Outlook, Skype and Office is actually powered by Bing. The general Microsoft audience based tend to be more mature, more education and more affluent that the general population. Most Aussies are probably using Bing without even realising it. “Marketers should put their money where it works. Based on the case studies that we have published, on average, Bing delivers double the ROI than Google does. It makes sense for Marketers to ‘max out’ on Bing first, spending the rest of their search advertising dollars across Google. 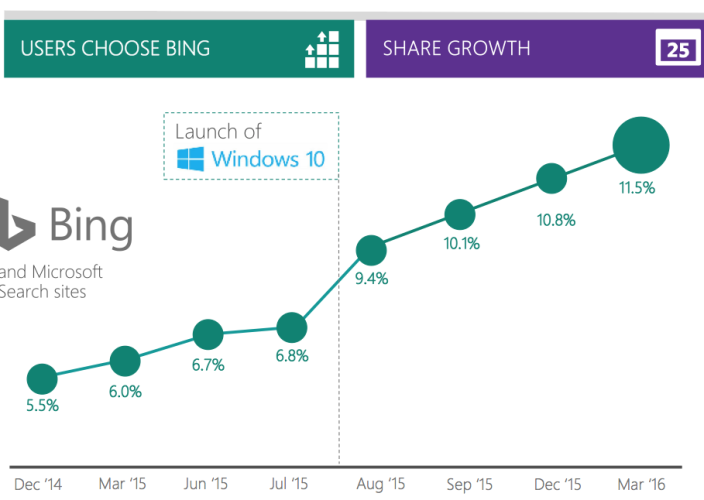 Bing Australia has 11.5 per cent share of all search queries, which sounds small, but that’s 137 million searches per month and nine million unique users per month. A decent size and cost-effective audience base,” O’Sullivan concluded.